On October 2, Datuk Yasmin Mahmood, Chief Executive Officer of the Malaysia Digital Economy Corporation (MDEC) announced the signing of Memorandum of Understanding (MoU) between the ASEAN Data Analytics Exchange (ADAX) and industry partners for the establishment of the Data Star programme to accelerate the development of data professionals. The Data Star Programme is a 6-month (monthly allowance of RM3000 or USD 710 for 6 months) paid finishing school for graduates that includes 2 months of intensive data science enablement and mentorship with experienced data scientists and placement at industry partners. The programme is driven by ADAX in partnership with universities and leading industry partners, including Kasatria, Fave, Tapway, Datalynx, Fusionex, GHL, Celcom, Leo Burnett and Quandatics, to fast track the development of data professionals that meet the needs of the industry. It is expected to help Malaysia achieve 20,000 data professionals by 2020; a goal set by the Government in 2015. The learning paths have been curated to support data and analytics knowledge development focused on 3 areas: Data Engineer, Data Analyst and Data Scientist. Students will be provided with the foundation skill sets for each of the knowledge areas. Courses would include lectures and labs sessions, hands-on programming and interactive sessions. Each of the learning paths includes a mentorship, project presentation and soft skill development days. The Data Engineer path will consist of 6 modules over 25 days. The objective of the course is to enable the participants to understand the importance of data management and to realise the value from the organisation’s data. Basic knowledge of programming is a pre-requisite for this course as the focus will be on database administrators who want to broaden their activity towards the whole data life-cycle. Students on the Data Analyst path will go through 7 modules in 21 days. Here, the goal is to equip the participants with the ability to set-up and run analysis using the programming language R, analyse data correctly and communicate and visualise findings. Participants will be taught to extract insights and knowledge from data. The course is aimed at students with little or no experience in analytics but with a grounding in maths. The Enterprise Data Scientist (EDS) course, with 7 modules over 42 days, is a practical fast-paced hands-on training for participants to explore the interdisciplinary field of data science. The course teaches participants how to think in a data-scientific way, conduct or simulate experiments on business activity, analyse data rigorously, develop predictive models and monitor model outputs. Graduates with PhD, Masters or Bachelors in Mathematics/Statistics, Computer Science, Actuarial Science, Engineering, Economics or Science. A knowledge in programming is an added advantage are invited to apply. 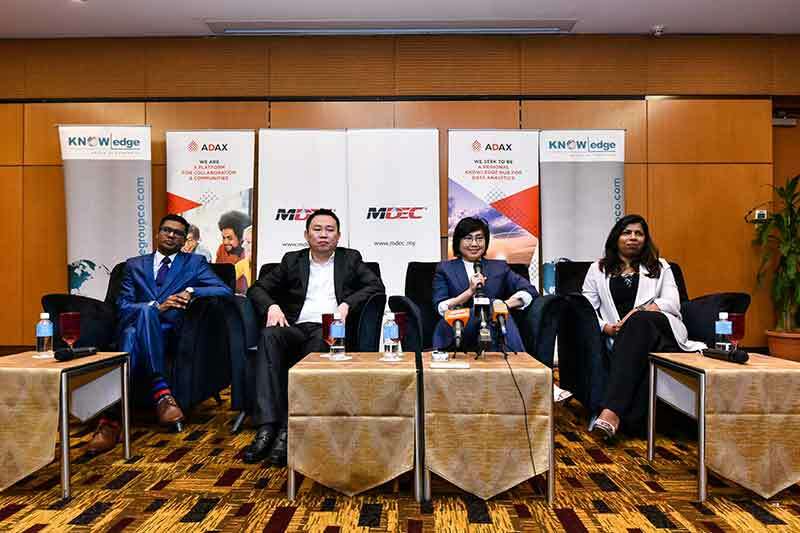 Datuk Yasmin Mahmood said, "The Data Star programme is a testament to MDEC’s unwavering commitment to develop a robust BDA ecosystem; in line with Malaysia’s vision to position itself as a data driven nation. So far, the country has produced 6,000 data professionals and we are confident that we will achieve 20,000 high-quality data professionals by 2020. Unique initiatives like the Data Star programme will significantly contribute to this agenda." "ADAX’s mission to nurture and grow data professionals for the ASEAN region has gone from strength to strength since we officially launched earlier this year. With the support from MDEC, we are confident that the Data Star programme will not only accelerate the growth of data professionals for Malaysia, but also, more importantly, produce world-class talent that suit the demands of the digital world. We look forward to working with renowned industry players to further develop the skill-sets necessary to tackle big data head-on. It is these partnerships with MDEC, ADAX and industry players that will drive the Data Driven ASEAN agenda successfully," added Ms. Axryd.